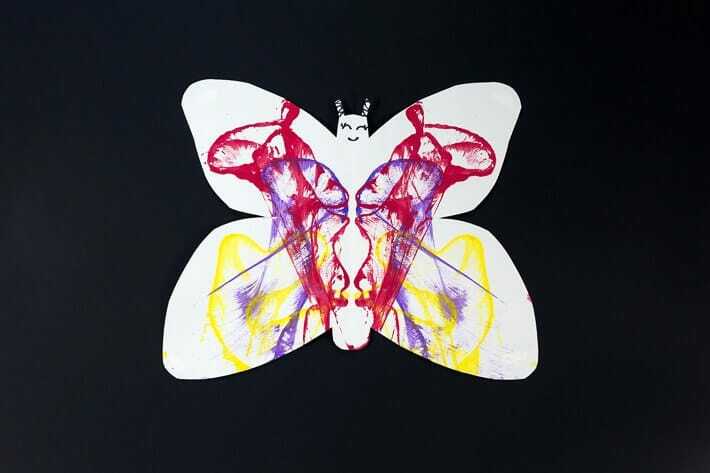 This butterfly art project for kids involves printing with paint-covered string. This results in pretty, symmetrical string art designs on the wings! This is another simple way for kids to make symmetrical butterfly art. String blottos are fun. It’s basically printing with string. String and paint. And since the results are symmetrical, it’s perfect for a butterfly art project. First, I’ll share a video of how we did this, then some instructions and photos. *Sometimes we use thinner string (such as embroidery thread) and sometimes we use thicker yarn. It just depends on what we have on hand and what effect we are looking for. The thinner string is a bit trickier for little kids to manipulate but will result in a more delicate design; the thicker string will result in thicker designs. 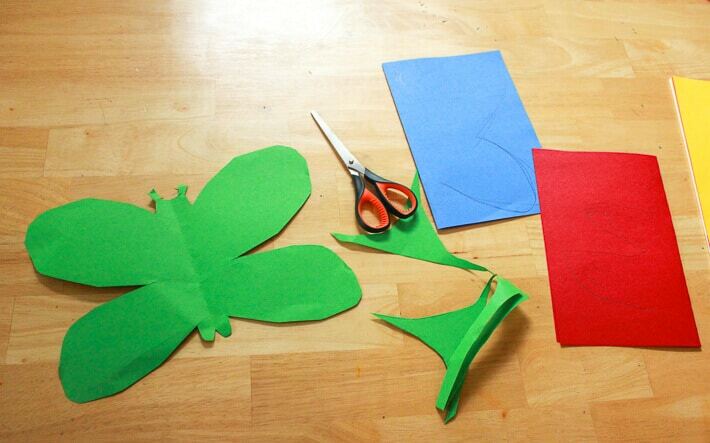 First, you’ll want to cut symmetrical butterflies out of your paper. Fold the paper in half, draw half a butterfly on the paper with the body along the fold line, then cut out along the line. Next, dip your yarn or string in the paint, using a spoon or your fingers to cover the yarn with paint. Arrange your paint-covered string on half of the paper butterfly. Use all one color or as many different pieces of paint-y string as you like. Fold the paper butterfly in half over the paint-covered string. Press the paper all over with your hands to make the print. Step 5. Open to reveal your butterfly design! Carefully open the butterfly to reveal your symmetrical string art design! Pull the paint-y string off the butterfly and put it back in the bowl of paint to use again. Let your artwork dry, then display or gift! If you like, you can draw on faces and bodies or glue on googly eyes. Or you can tape your butterflies directly to the wall. Or string your butterflies together into a garland. Ice painting is so much fun. I love all the vibrant colors you used. So fun! What kind of paper is that? Art is also considered as a way to approach towards the ultimate reality like philosophy and religion does, the Artistic mindset can create critical and creative thinking in children’s minds and this may be led them to a potentially beneficial member of the society who has some objective approach towards life.